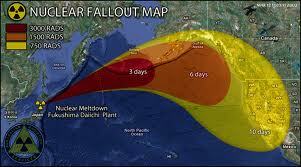 Fukushima FALLout . . . The unimpeded outflow of radioactive material from 5 nuclear power plants has not abated, so if you have stopped thinking about it – it’s time to think again as contaminated debris and marine life is pervading the Pacific west coast. Avoid foods/drinks/products from Japan and Eastern China. Stop eating tuna, pacific cod and taper off fish consumption in general (especially true for children). Drink carbon-filtered water or a combination of reverse osmosis-carbon filtered water (note that many bottled waters are NOT filtered and clean). Wash vegetables in water with a pinch of borax powder. Consider growing veggies in covered greenhouses using filtered water that you can recycle. Most fallout arrives as rain/fog/dew. Reduce or cut out dairy products, especially cows as bioaccumulation from rainwater continues to raise cesium levels. Eat naturally occurring antioxidant-rich plants: fresh berries of all kinds, raw fresh vegetables, sprouted/naturally fermented foods and super-greens like grasses (oat, alfalfa, barley, wheat), spirulina, chlorella etc. Use adaptogenic herb that contain Nrf- stimulating phyto-chemicals on a daily basis (see What’s Hot below). Do seasonal bowel cleansing with substances that are known to draw out radioactive elements: clay, charcoal, and apple pectin. Eat sweeping fibers like flax, apples, chia, okra and some seaweed daily. Here’s some more information . . This is truly the time to learn and practice the art of transmutation and transformation back to balance. Nature has a lot to teach us in this regard so don’t rule out what might look impossible.